Following directions is a skill that will support young learners for life. Setting goals to work cooperatively and to follow directions help with academic achievement. Teach students what it looks like to follow directions. Students need to understand that they shouldn't have to be reminded or asked several times. Following directions also means students will need to listen in order to remember what the directions are. Sometimes students who miss the directions fail to listen. Listening may be an important goal to address if this is the case. 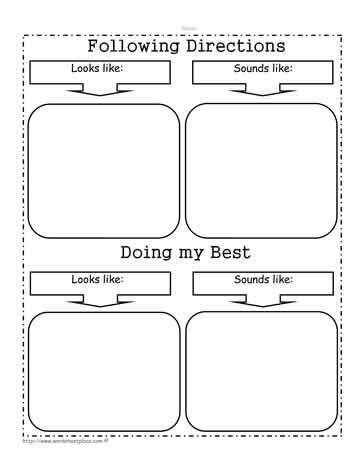 This following directions worksheets is suitable for learners of all ages.